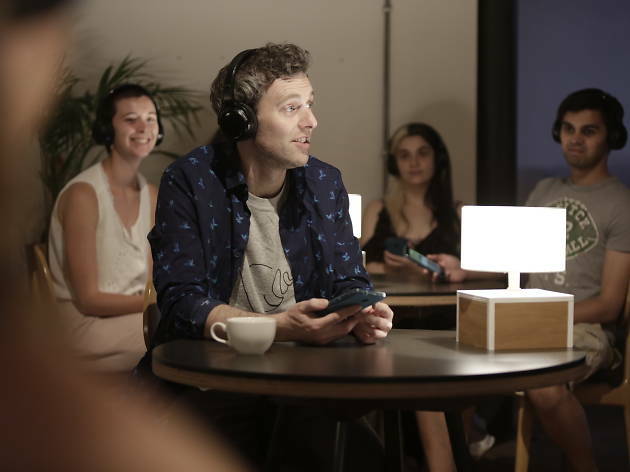 Dante or Die’s gorgeous site-specific show about grief and digitial afterlives is performed in a cafe. After we sit down, last orders are taken, and we’re issued with headphones and a phone, and meet Terry (Dante or Die co-artistic director Terry O’Donovan). In a raw and magnetic performance, O’Donovan paces, sometimes even dances about the cafe – but often we look away, our attention on his voice in our ears, and the frequent action on our screens. Luka, Terry’s ex-boyfriend of nine years, has died – something that Terry is late finding out. He is tipped off not by a phonecall, but a sudden rush of oblique condolence messages that all assume he is aware of the death. He is stricken by the news. As he’s struggling to process the sudden flood of old acquaintances and estranged friends getting back in touch, he receives an unusual message from a company called Fidelis: he has been made the executor of Luka’s social media legacy, entrusted with deciding what happens to his presence after death. 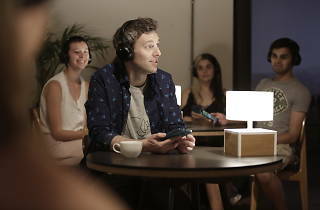 ‘User Not Found’ becomes a dance of sadness, memory, and technology, as Terry attempts to process his sorrow at Luka’s passing, and unresolved anger about their relationship’s ended. And, of course, he trawls through Luka’s social media – obsessively cross-referencing major dates in their relationship with Luka’s often maddeningly bland Twitter feed, or combing his Facebook feed to fill in the gaps between their separation and Luka’s death. (By-the-by, I feel like it’s illustrative of this supremely detailed show to note that a very plausible French popstar named Laurent Mercier who Luka was a fan of appears to have been made up for the purposes of the play. There’s a slick music video and everything – a drolly amusing detail that must have required a terrifying amount of work). What Goode does beautifully is draw a line between the idea of letting go of a person’s web presence and letting go of a person full stop. Terry goes on a wild, occasionally hallucinatory ride as he moves through stages of grief and simply struggles to process what happened. What ‘User Not Found’ doesn’t really do is engage with the idea of a digital legacy. At no point does Terry really contemplate what it means to erase somebody from the internet. Though Terry frets over whether he’s the right person to make the decision, when he does so, it seems like a natural culmination of his personal grieving process rather than because he’s really given thought to literally deleting evidence Luka existed, his photos, his writings. But Goode is so good that if it feels like he’s turned in a slightly different assignment to the one expected, it doesn’t really matter. It’s a gorgeous show about grief in the era of hyper connectivity, and it hardly ducks talking about technology. Our glowing phones bring Terry’s loss closer, but also distance us from it – a text or email of condolence is not the same as having to talk about it. ‘User Not Found’ is ultimately coy about the question of whether we have a right to be forgotten – but it is certain that we all have a right to let go. This review is from the 2018 Edinburgh Fringe.